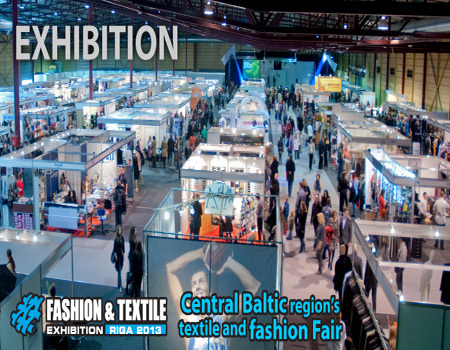 RIGA, LATVIA - The main fashion and textile exhibition for the Baltic States will take place in Riga, Latvia from 19-21 April. The Fashion & Textile Exhibition 2013 will focus on new technologies, natural and ecological fabrics and environment awareness. It will look at several themes, such as innovations in the textile industry in Latvia, growing competitiveness in the industry and clothing design as an indicator of added value. The conference aims to encourage a dialogue among the representatives of the fashion and textile industry in the Nordic countries, Baltic States and Russia. It is being organised by the International Exhibition Company BT 1 in cooperation with the Latvian Association of Textile and Clothing Industry, Latvian British Chamber of Commerce, Nordic Council of Ministers’ Office in Latvia, the Danish Cultural Institute, the Latvian Fashion Council, The Association of Latvian Lingerie Manufacturers and the Investment and Development Agency of Latvia. Last year the exhibition was attended by around 179 participants from 11 countries – Lithuania, Estonia, Poland, Italy, India, Russia, China, Belarus, Finland, Spain and the host Latvia.